In a large saucepan, combine the milk with the cream, 3/4 cup of the sugar, the vanilla beans and seeds and cinnamon sticks and bring to a simmer. Remove from the heat, cover and let stand for 30 minutes. Strain the mixture through a fine sieve and return it to the saucepan. In a small bowl, sprinkle 3 teaspoons of the gelatin over 1/4 cup of cold water and let stand until softened, about 2 minutes. Scrape the gelatin into the saucepan and whisk until dissolved. Transfer the mixture to a pitcher and pour about 1/2 cup into each of 12 small glasses. Refrigerate until chilled, at least 4 hours. In a clean saucepan, boil the pear juice with the remaining 3 tablespoons of sugar until reduced to 1 1/2 cups, about 15 minutes. Sprinkle the remaining 1 teaspoon of gelatin over 1 tablespoon of water and let stand until softened, about 2 minutes. Whisk the gelatin into the pear juice mixture until dissolved. Transfer the mixture to a pitcher and let cool completely (but don’t let the gelatin set), about 30 minutes. 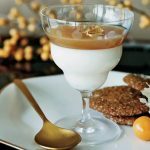 Gently pour 2 tablespoons of the pear juice into each panna cotta over an inverted spoon and refrigerate until set, at least 2 hours. Serve with the Spiced Ginger Cookies.